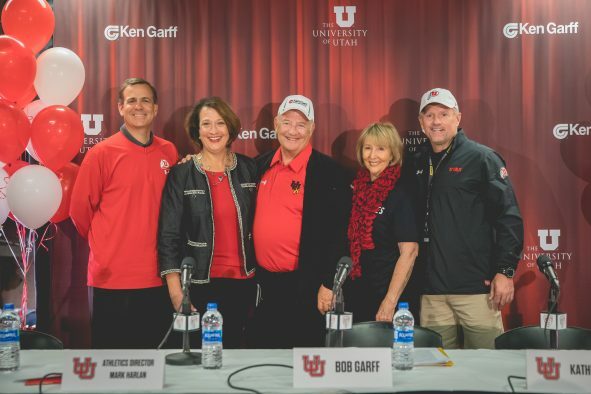 The Ken Garff family donates $17.5 million to the Rice-Eccles Stadium expansion. University of Utah President Ruth V. Watkins and Director of Athletics Mark Harlan announced the largest gift in Utah athletics history today in a press conference held prior to the annual Red-White game. The Ken Garff family has pledged $17.5 million for the Rice-Eccles Stadium renovation and expansion. The Ken Garff Automotive Group ranks in the top 10 automotive groups nationally, remaining true to Ken Garff’s legacy of making lifelong friends and customers. Ken Garff opened his first dealership in 1932 and quickly built a thriving company that embodied his trademark work ethic and values. The Ken Garff Automotive Group is comprised of 50 dealerships nationwide and sells over 120,000 cars and trucks each year. The automotive group represents iconic brands such as Mercedes, Porsche, Jaguar, Land Rover, Volvo, Audi and more. The university announced the fundraising campaign in November after a feasibility study demonstrated strong community support and market demand for an expansion and renovation of Rice-Eccles Stadium. The project involves the south end zone—the only feature of the old stadium that remained when the current facility opened on the same grounds in 1998. The renovations will include enclosing the stadium bowl by connecting the east and west concourses on the south end, increasing audience capacity from 45,807 to 51,444. The Ute football team has played to 56 straight sellout crowds in Rice-Eccles Stadium since the 2010 season opener and the season ticket waiting list has grown to nearly 3,000. The upgrades will also enhance the fan experience by adding premium seating in luxury suites and loge boxes, as well as club, ledge and rooftop seating. The dilapidated locker and meeting rooms below the current south end zone stands will be replaced and modernized, along with new spaces created for coaches, officials, athletic training, equipment, press operations and the band. A kitchen, recruiting lounge, field-level club lounge and outdoor patio are also in the plans. Construction will begin after the last home game in 2020 and will be completed prior to the kickoff of the 2021 football season.